The Buffalo Bills improved their home record to 4-0 on the season with their 34-14 win over the Oakland Raiders on Sunday. Overcoming several injuries on the defensive side of the ball, the Bills forced four Oakland turnovers, including a Matt Milano scoop-and-score before the end of the first half. Offensively, Buffalo running back LeSean McCoy had his way with the Raiders’ defense. The veteran back totaled 173 offensive yards on 33 touches, including a 48-yard touchdown run late in the fourth quarter. Oakland, on the other hand, missed suspended running back Marshawn Lynch, dearly. The Raiders’ sophomore speedsters DeAndre Washington and Jalen Richard combined for just 47 yards on 11 carries. The Raiders’ lackluster rushing attack forced quarterback Derek Carr to pull the entire offense onto his shoulders, a weight he simply couldn’t bare for all four quarters. He completed 31-of-49 attempts for 313 yards and one touchdown against two interceptions. With that, we give you our PFF exclusive takeaways from the contest for each team. Glenn was outstanding protecting Tyrod Taylor’s blindside against the Raiders. He did not give up a pressure in his 31 snaps in pass protection, netting him an 83.6 pass blocking grade. Glenn was also solid when run blocking as was the rest of the Bills offensive line, he finished with a 77.7 run blocking grade. Holmes helped compliment the Bills’ dominant rushing attack as Taylor’s most reliable weapon. Holmes caught three of his four targets for 50 yards and a touchdown. Taylor’s passer rating was 156.3 when targeting Holmes. Hyde had an excellent day in coverage. On 49 cover snaps, Hyde was targeted five times, and allowed three catches for just seven total yards, all to Cordarrelle Patterson. He also made a nice interception after Preston Brown tipped the ball in underneath coverage. Hyde now leads the NFL with five interceptions this season. Wright covered Michael Crabtree for much of the game, and gave up three catches for 54 yards. However, he was targeted another six times where he did not give up an touchdown, including three pass breakups, though one was nullified due to a penalty on a teammate. Hudson had another perfect day in pass protection, his seventh game out of eight this season without allowing a single pressure. With just one hurry allowed all year, his 99.8 pass blocking efficiency is the best in the league among all centers. 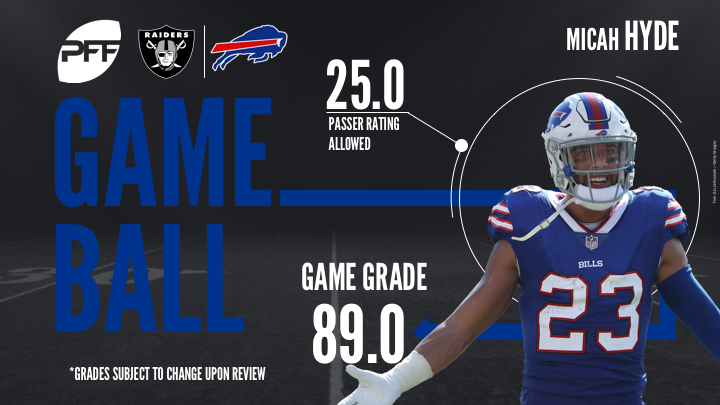 Carr threw for a lot of yards against Buffalo, but his overall performance didn’t quite match up. Nearly half of his yards came after the catch and 25 of his 31 completetions came on passes that traveled fewer than 10 yards past the line of scrimmage. He was off-target on several throws, and forced a few others into tight or double coverage that resulted in pass breakups. On a tough day for the Raiders front seven, the safties showed up to play. Nelson was a factor both in pass coverage and in run defense. Although he often plays far back in the middle of the defense, Nelson was not targeted once in the pass game. He also recorded a run stop and three tackles and had a run defense grade of 80.4. Luani was solid in pass coverage allowing three receptions on five targets for 52 yards. He also added in a pass defense. Luani was solid in run defense, recording one run stop and finished with a 75.4 run defense grade.